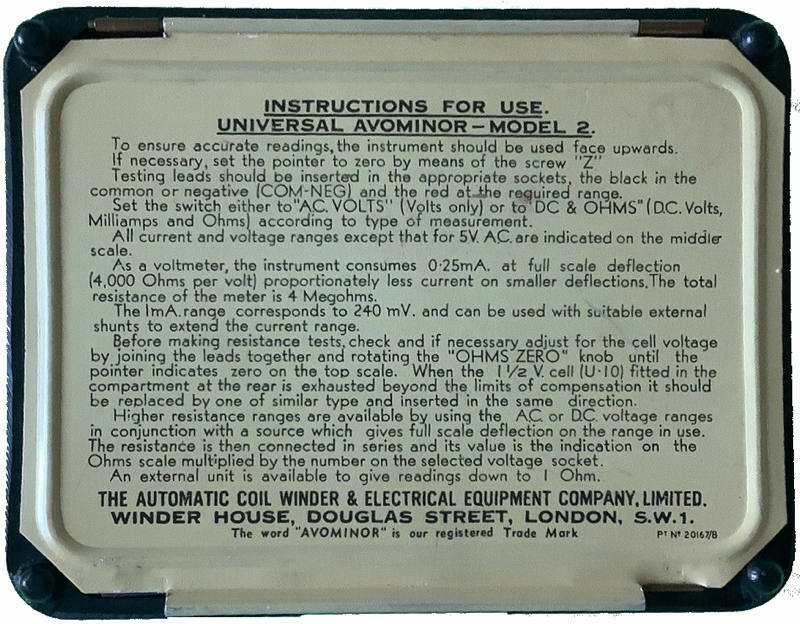 The battery compartment was designed to take the now obsolete EverReady U10 which is the same size as one of the cells in a 4.5Volt flat cycle lamp battery. 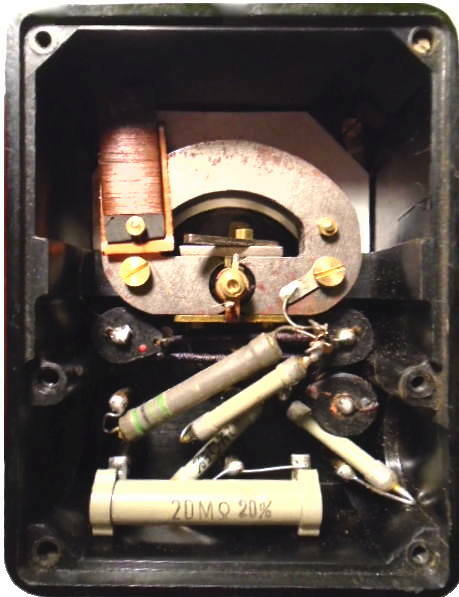 An AA cell could be used with a spacer or modified spring. 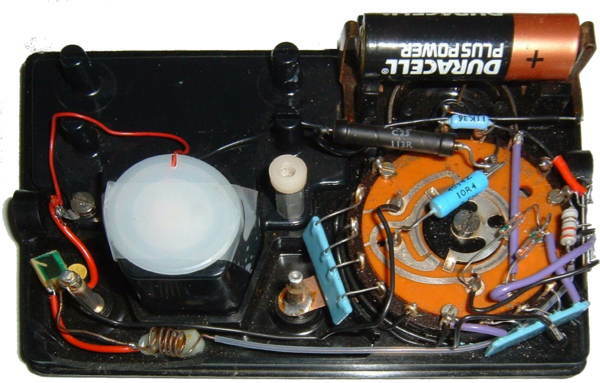 later models have one piece magnet and stepped sides to Bakelite case. 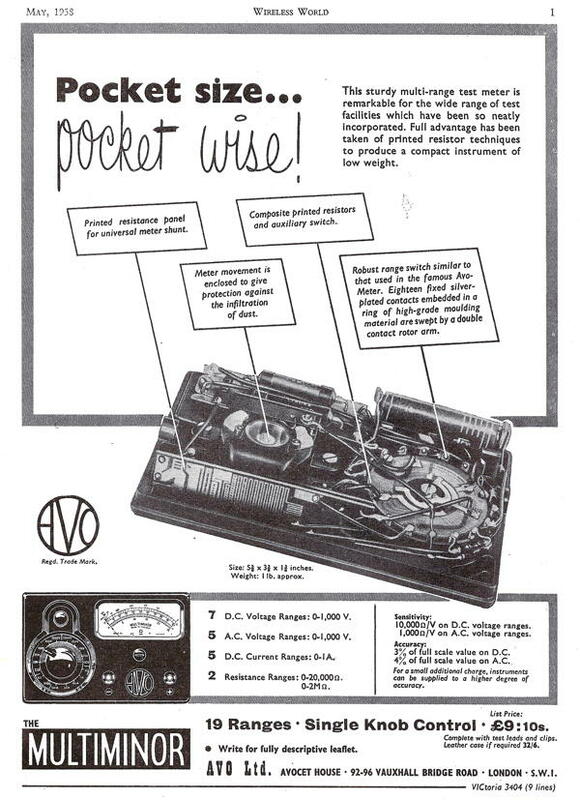 The following is from an advert at the time of its introduction. 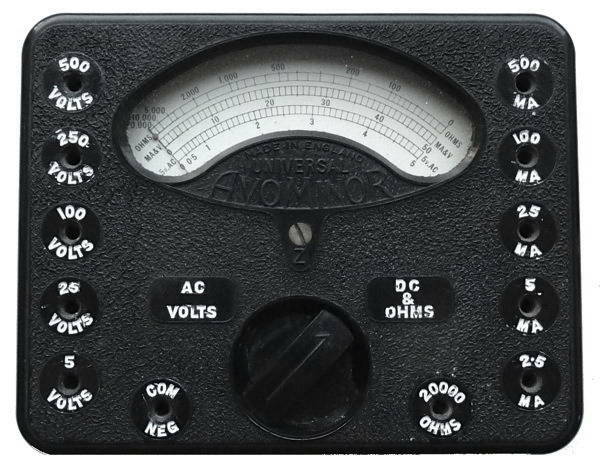 A new instrument has been developed of the same size and appearance as the DC AvoMinor, but it is especially suitable for the direct measurement of grid bias and television voltages and currents. 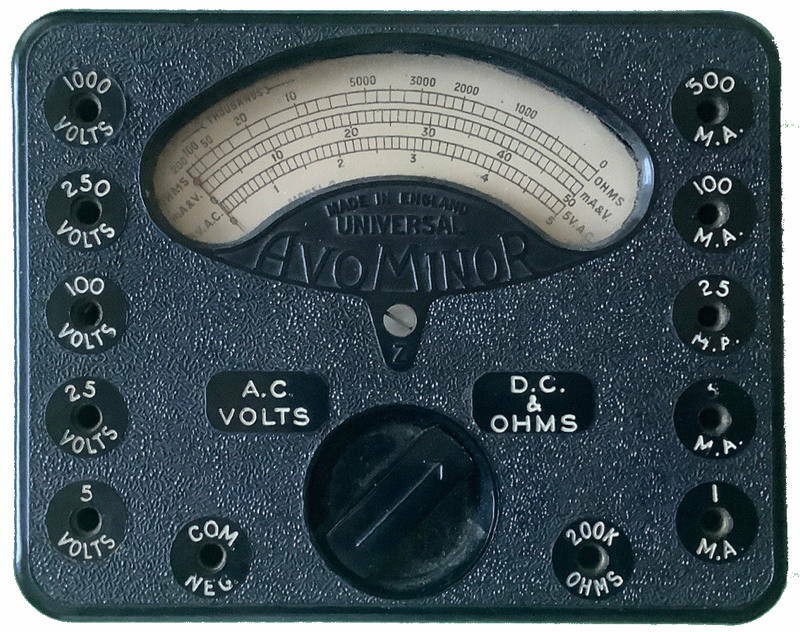 In its essentials, it is an extremely sensitive DC micrometer calibrated as a multi-range Voltmeter and megohm meter. 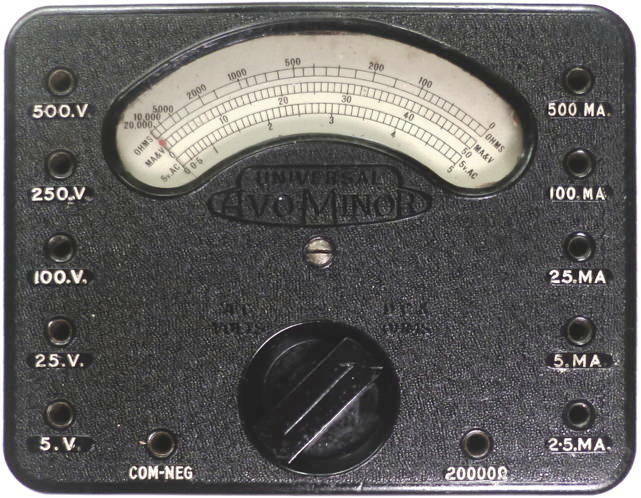 As a voltmeter, all six ranges are of 20,000 ohms per volt which corresponds to 50 microamp consumption at full scale deflection. 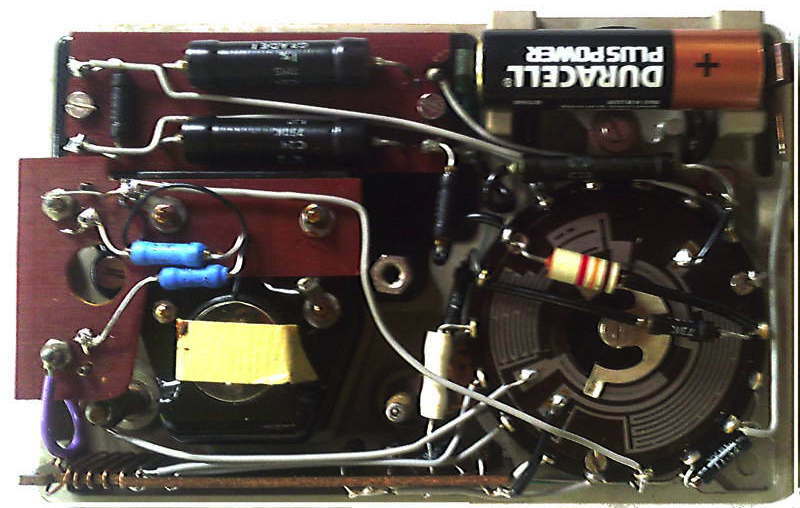 For resistance measurement an external source of DC voltage is required, the scale being calibrated for use with the 10-volt socket,while adjustment is provided for the actual voltage employed. 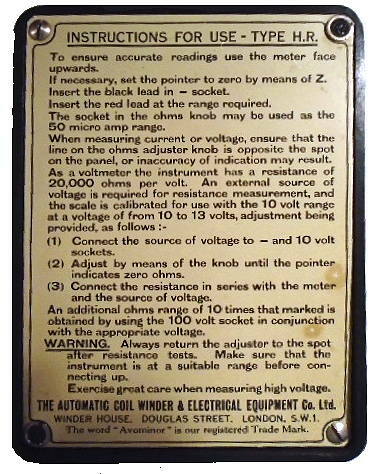 If 100 volts is applied to the appropriate socket, the resistance scale should be multiplied by 10. I am indebted to Dave Philpott for these images of his 1938 meter. 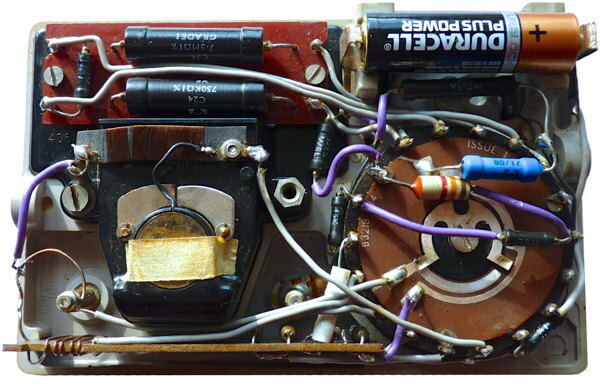 I am indebted to Dave Philpott for these images of his 1941 meter. These two in my collection were made in 1935 and 1946, they continued to be made into the 1950's. 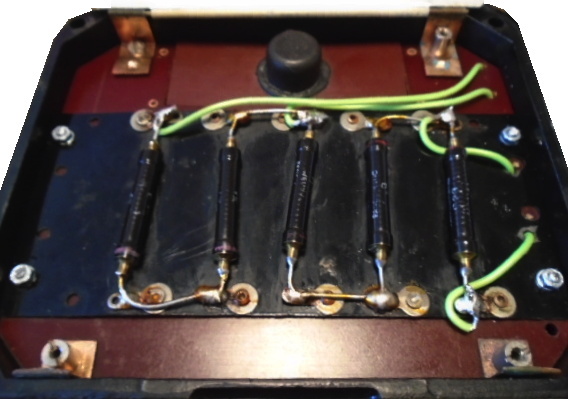 An extra board holds Welwyn resistors for the higher voltage ranges. 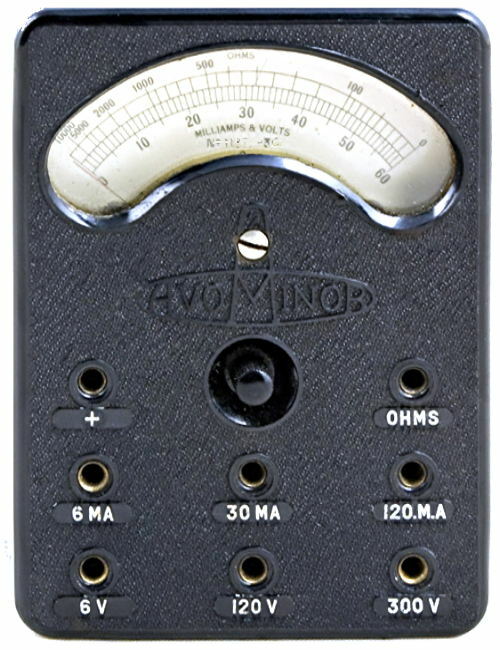 To use the Low Ohms range, short the COM NEG and 20,000 OHMS sockets, and adjust for zero. The resistance under test is then put across 2.5mA and 500mA ports. 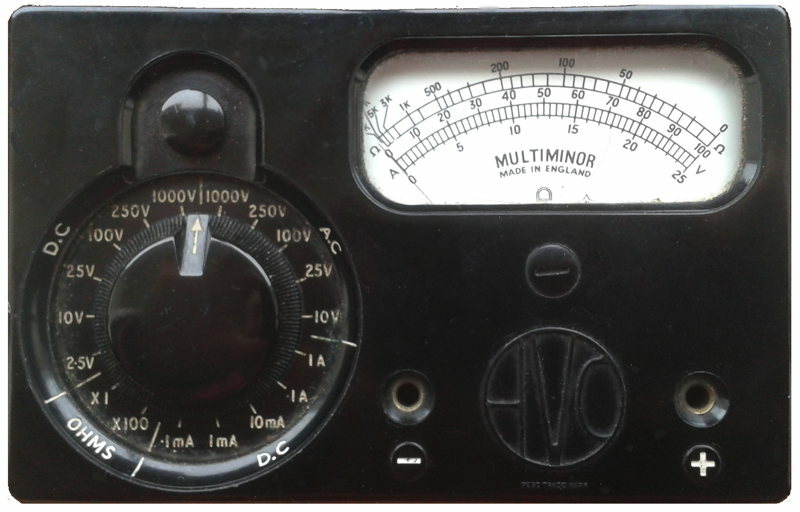 I am indebted to DavePhilpott for these images of his 1955 meter. 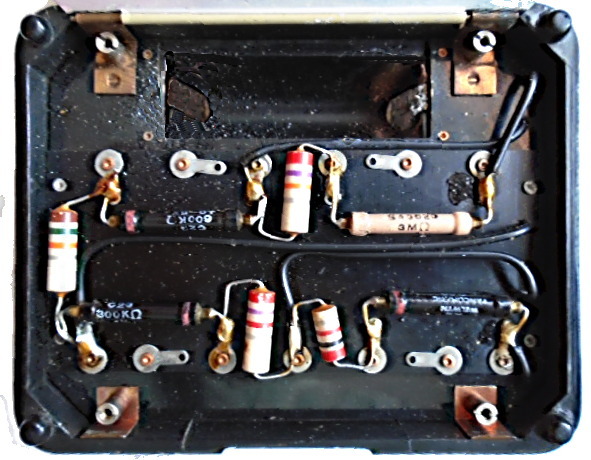 Composite printed resistors and robust range switch similar to that used in the famous AvoMeter. Eighteen fixed silver plated contacts embedded in a ring of high-grade moulding material are swept by a double contact rotor arm. 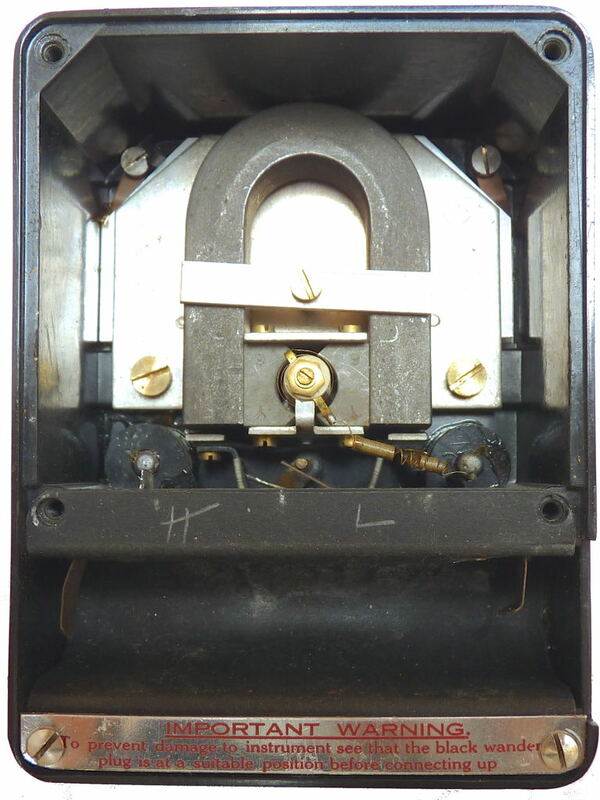 Meter movement is enclosed to give protection against the infiltration of dust. 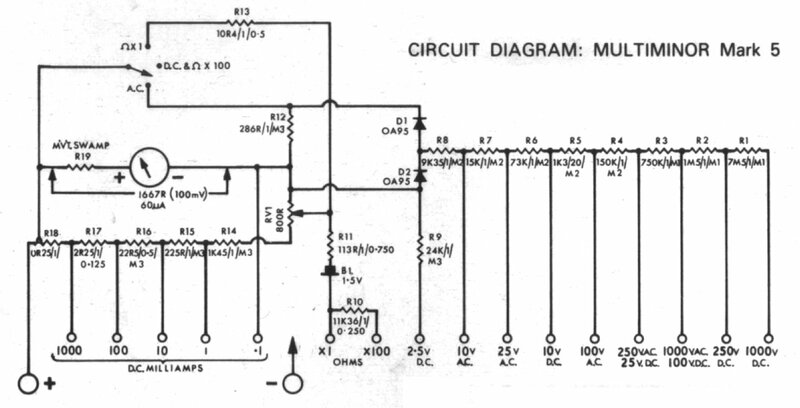 7 D.C. Voltage Ranges: 0-1,000 V. 5 A.C. Voltage Ranges: 0-1,000 V.
5 D.C. Current Ranges: O-IA. 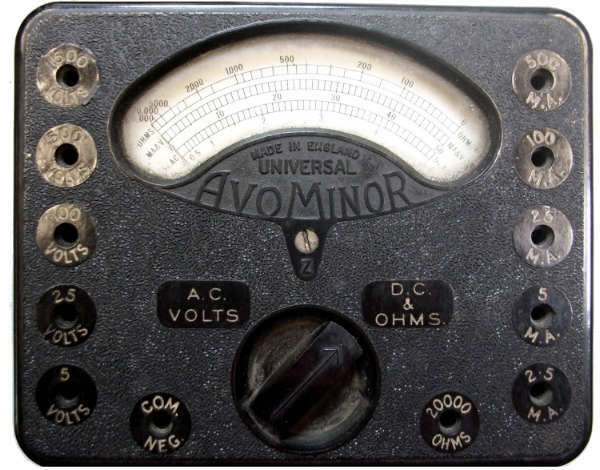 10,OOO ohms/Volt on D.C. voltage ranges. 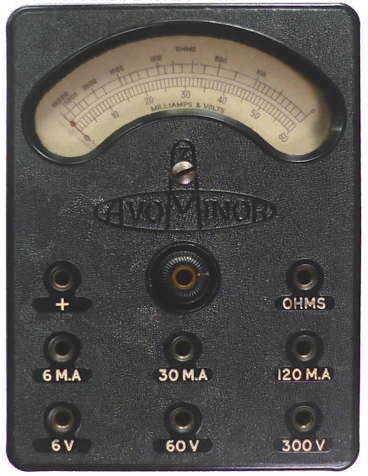 1,OOO ohms/Volt on A.C. voltage ranges. 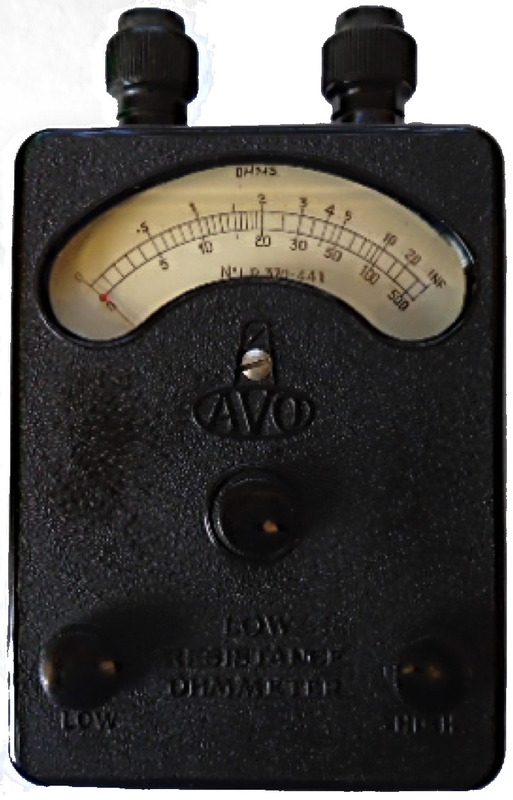 3% of full scale value on D.C.
For a small additional charge instruments can be supplied to a higher degree of accuracy. 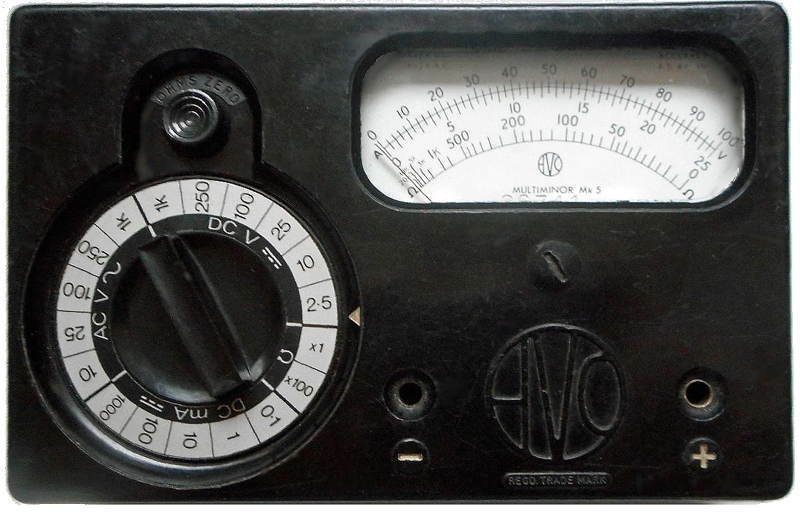 19 Ranges· Single Knob Control· List Price: £9:10s. Complete with test leads and clips. 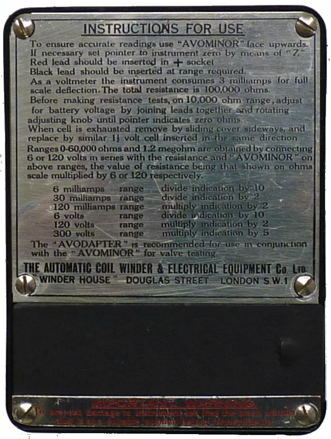 Leather case if required 32/6. 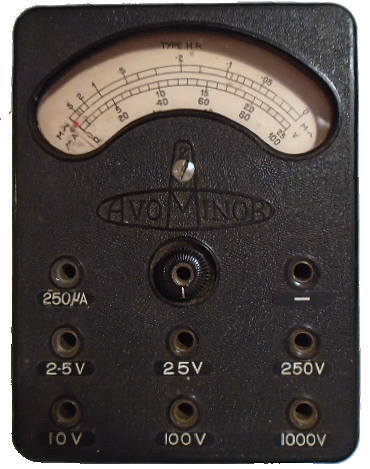 Ohms scale moved to bottom of scale plate, germanium rectifier if not before. 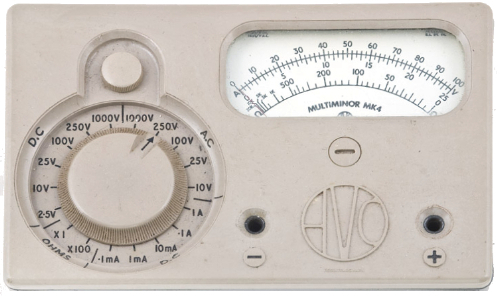 The current model (1970) of this famous Avo instrument is styled on modern lines, with high standards of accuracy, improved internal assemblies and incorporating panclimatic properties. 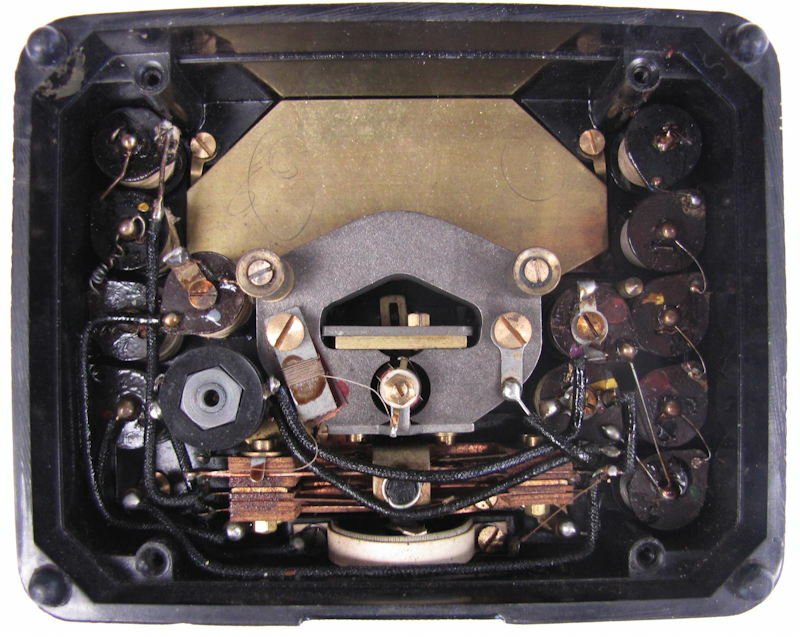 A single rotary switch selects any one of the 19 ranges. 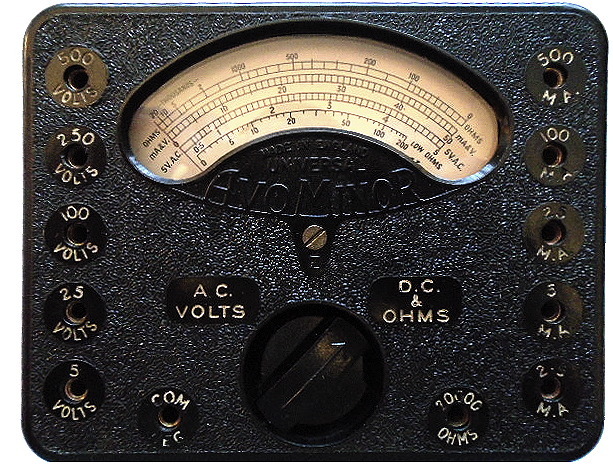 Two scales are provided for current and voltage readings and another for resistance measurements. 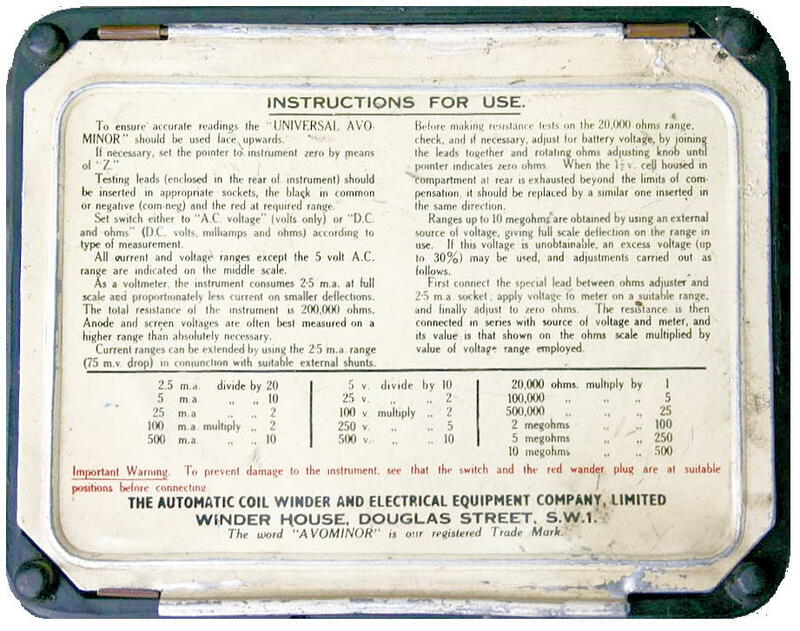 The instrument is supplied in an attractive black carrying case, which also houses a pair of leads with interchangeable prods and clips, and an instruction booklet. 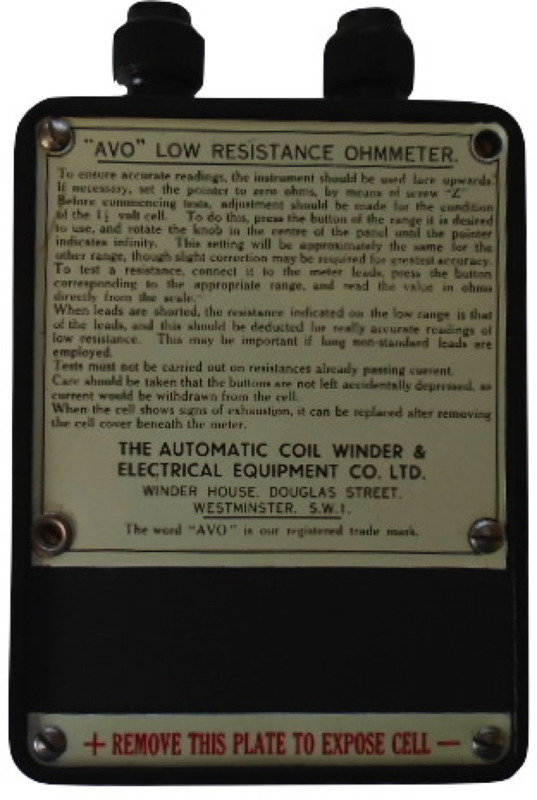 A robust simulated leather case is available if required. 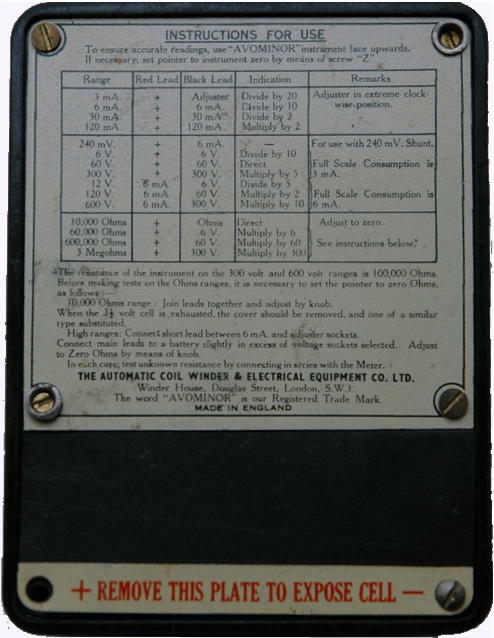 Size (including case): nx4xHin. 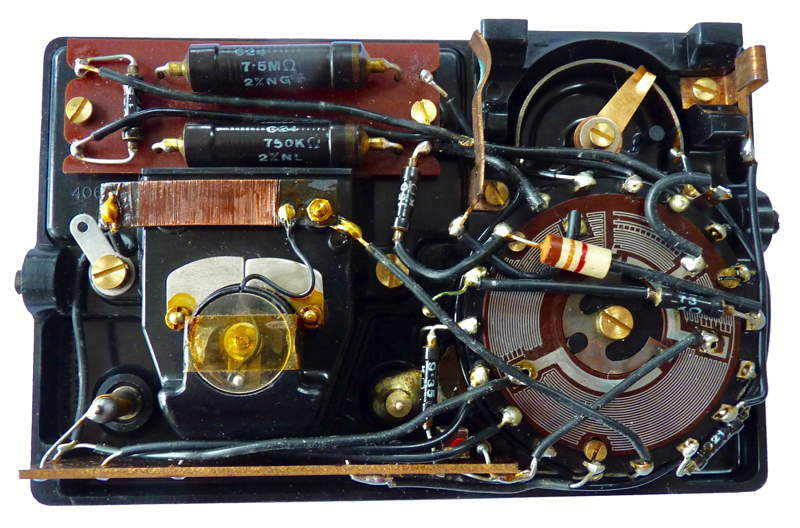 (197x102x41 mm.). 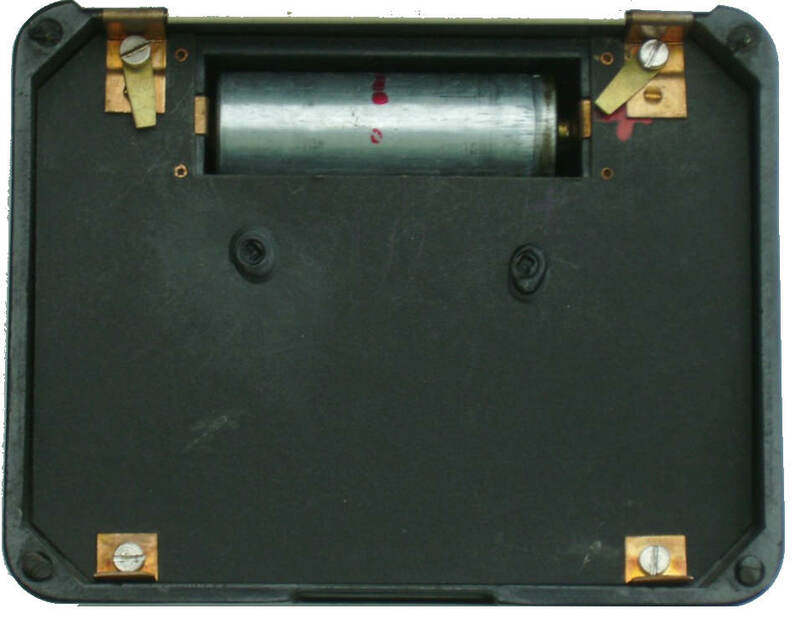 Weight (including case): 1 t lb. (0.675 kg.). D.C.100µA to 1 A f.s.d. in 5 ranges. 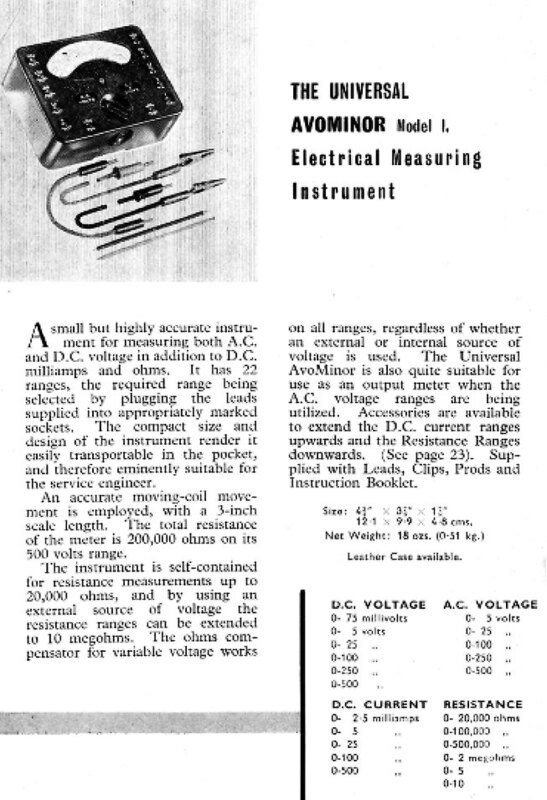 A.C.10V to 1,000V in 5 ranges. D.C.100mV to 1 ,OOOV f.s.d. in 7 ranges. 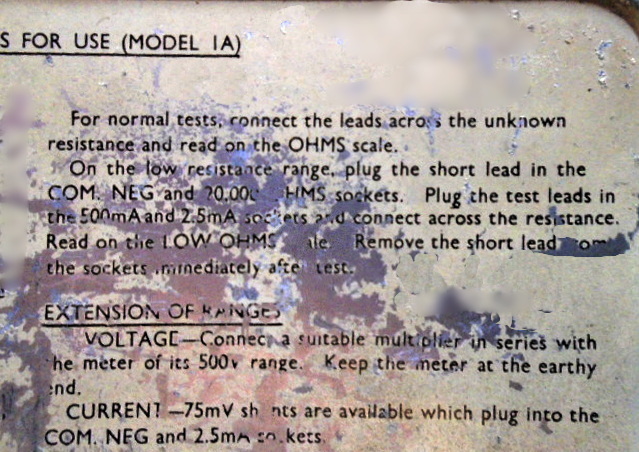 Resistance: 0 to 2M ohm in 2 ranges (first indication 5 .. 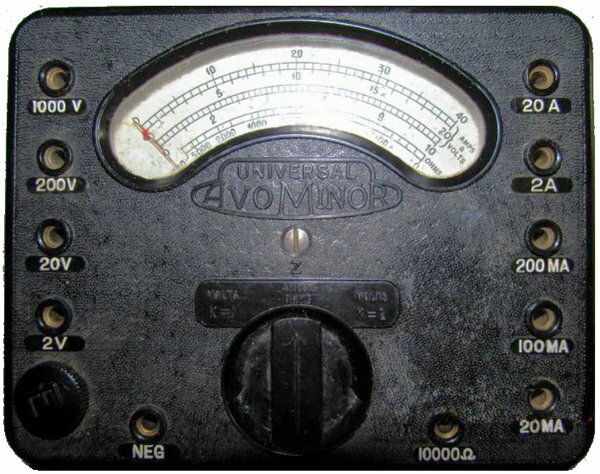 Sensitivity: D.C. voltage ranges 10,0000/V. 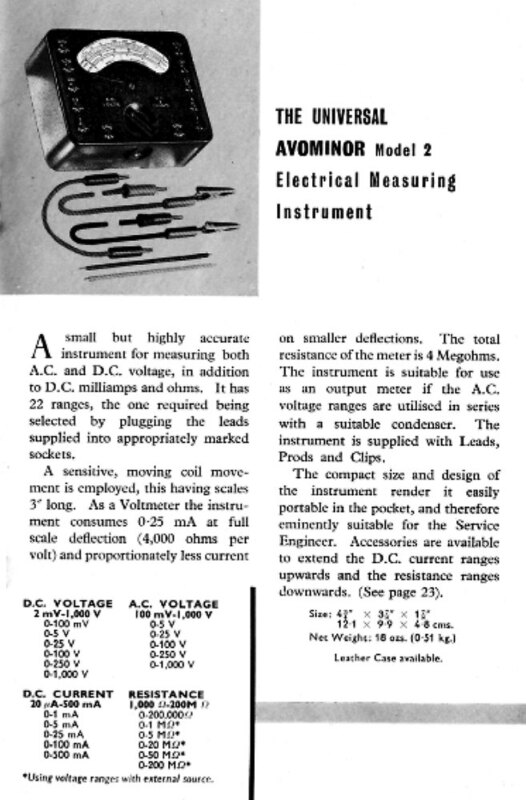 A.C. voltage ranges 1 ,0000/V. 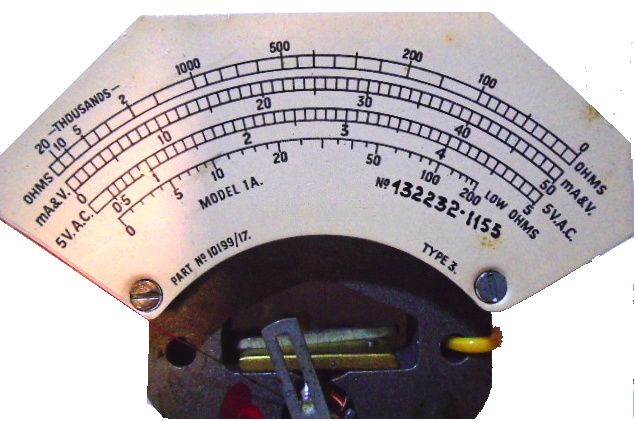 Accuracy: A.C. voltage ranges 2.75% of f.s.d. 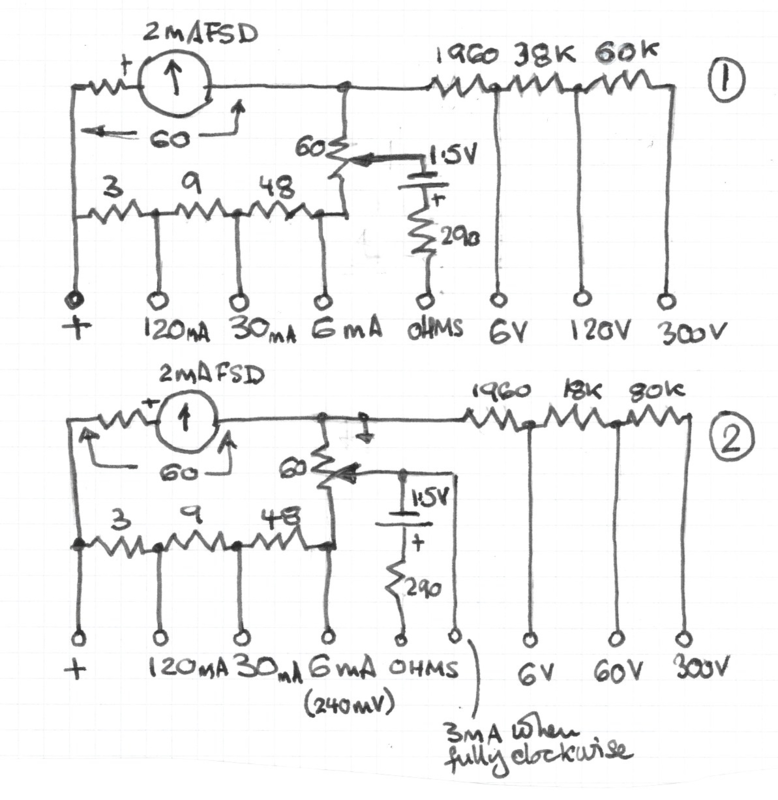 D.C. voltage and current ranges 2.25% of f.s.d. 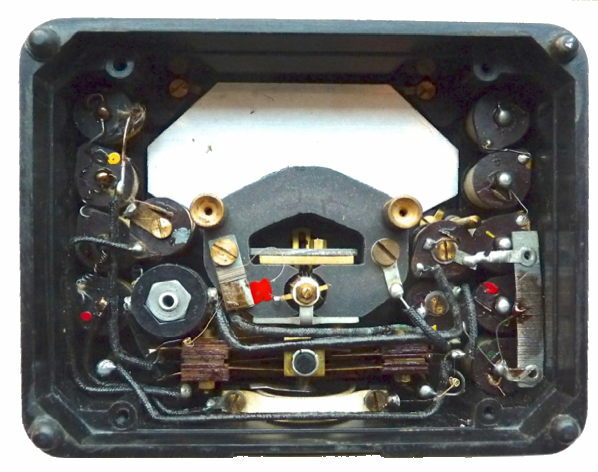 Note that the shunt for the highest range is no longer printed and that the switch wafer does not have printed adjustment resistors. 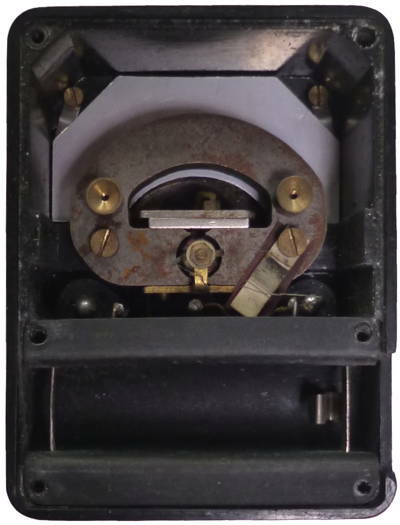 International symbols, design like Model 8 Mk 5 and new meter movement and minor internal changes.